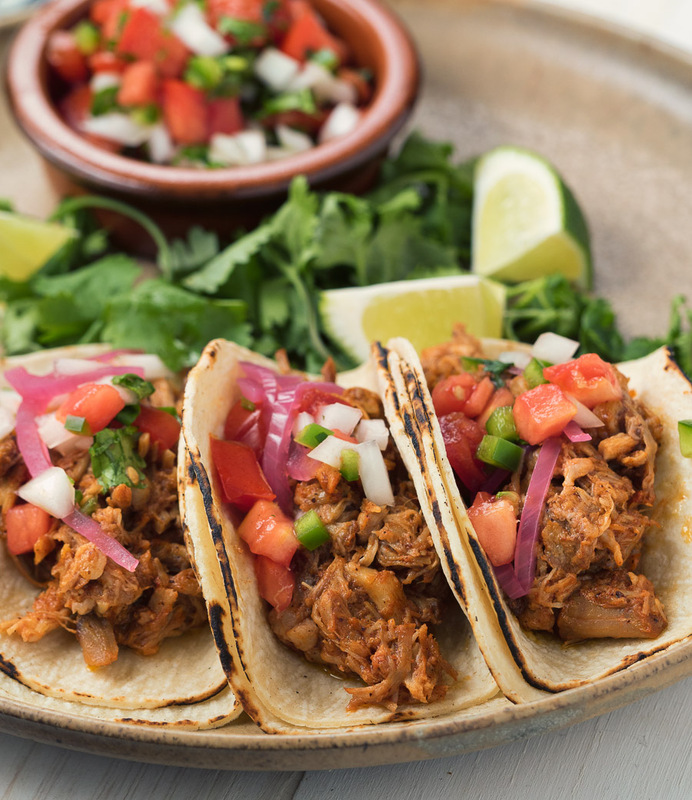 Yucatan pulled pork – cochinita pibil – is one the most flavourful pulled pork dishes out there. It’s loaded with big citrus and achiote taste. Roasted garlic and some good old fashioned smoke pushes it way over the top. This is pulled pork Mexican style. If you are thinking about a taco party it’s not easy to do better than this. Seriously. I smile when I make this. Because I know everyone will love it. Because I know I will love it. And because it’s almost impossible to screw up. Make it with pork shoulder. Pork shoulder is probably the most forgiving cut of meat going. When was the last time you had really bad pulled pork? If you search for cochinita pibil, you’ll find recipes ranging from near impossible to slow cooker wanna be’s. This one sits in the middle. Mix up a few ingredients in the blender. Marinate some meat. Wrap it up in parchment. Put it in a pan. Toss it all on the grill and walk away. Come back when it’s fork tender and shred it. Drizzle the juices over the meat. Eat. Smile. Perfect. It’s not particularly hard but it’s not throw it into a crockpot and hope it will turn out either. And the results are way closer to the near impossible end of the spectrum. Achiote paste is a compromise here. Big simplification. No sourcing annatto seeds. No toasting and grinding spices. Not super-authentic maybe but achiote paste comes from the Yucatan so it’s not like I’m pushing Hamburger Helper here either. Parchment is the other cop-out. No banana leaves. 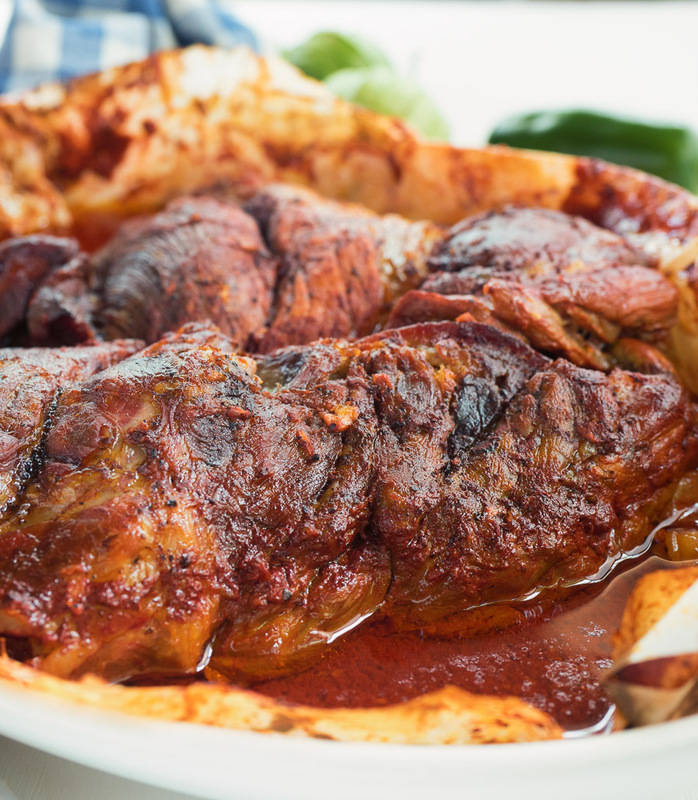 Cochinita pibil relies on smoke and steam. Parchment is an easy way to do just that. But these are minor variations from the truly authentic. And the flavours won’t suffer. It is still absolutely awesome pulled pork. Cochinita pibil. Well seasoned. Smoky. Delicious. Try yucatan pulled pork - cochinita pibil - and you will never be satisfied with run of the mill taqueria tacos again. Roast the garlic in their skins. Use a small cast iron frying pan over medium heat and toss them until they blacken slightly and soften. This takes about 3-5 minutes. Combine the peeled, softened garlic with the lime and orange juice, achiote paste and salt in a blender and blend thoroughly. Check to see if the achiote paste is broken up - it can be a fight. Marinate the pork in the marinade 2-4 hours. There's citrus in the marinade. Citrus is acid and it "cooks" the meat so you don't want to let it go too long. If you go too long you get that horrible mushy texture. Prepare your grill for indirect heat. Charcoal is good here, gas and your oven are about the same. If you are using a gas grill try for some smoke from a few wood chunks or chips. If you don't have wood smoke then just use your oven. In any case you are shooting for about 325F. Here's where it gets a bit tricky. You need to cook the pork with the marinade. In Mexico they use banana leaves. I have no banana trees where I live so I use parchment. The idea is that you will take parchment, scrunch it up so it forms a receptacle to hold one slab of pork along with half the marinade. You will then take a second piece of parchment and cover the pork - wrapping it down around the pork. Think parchment bundle. Pork en papillote really. Cut 4 pieces of parchment paper big enough to almost wrap the pork slabs. You are going to be cooking the pork in a rectangular cake pan or a foil tin (about 10 inches by 14 inches) with two pork and marinade bundles. Place a piece of parchment in the cake pan and form it into a bowl. Put the pork in the bowl along with half the marinade. Now place the second piece of parchment over the pork and fold it around to form a bundle. This pork steams in the marinade so the idea is to trap the marinade. It doesn't have to be perfect - you want some smoke to get in after all. Repeat the whole process with the second slab of pork and second half of the marinade. Place the baking tin/foil tin on the grill and cook for about 3-4 hours. You are after fork tender. Once the pork is fork tender remove the pan from the grill/oven and let cool about 20 minutes. Remove the pork from the parchment packets but make sure you keep all the marinade/juices from the pork. Defat the juices. A turkey fat separator works well here. Putting the drippings into the freezer briefly to get the fat to solidify so you can spoon it off also works. Don't let it freeze - you just want the fat solid. Using two forks, shred the pork. After you shred it, coarsely chop it. Mix the marinade in with the pork and make tacos - some pork, some pico and some pickled onions. You can get achiote paste at any latin market. It's pronounced "achot" so ask for that if they look at you like you're crazy. Yucatan pickles onions recipe can be found here. In bbq and grilling, main course, meat, mexican, pork. Bookmark the permalink.